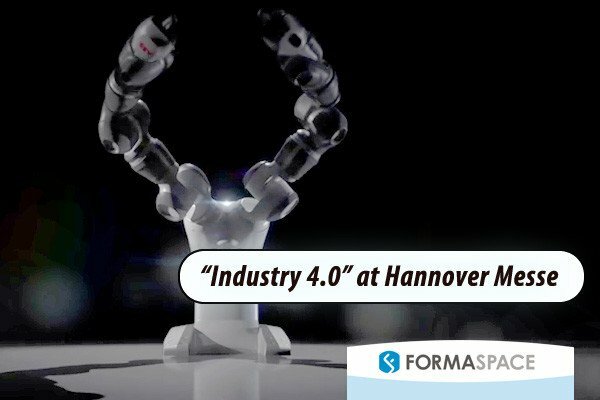 Robots took center stage this week at the Hannover Messe, one of the world’s largest trade fairs held annually in Germany. Over the past few years, the German government has championed a high-tech strategy designed to completely revolutionize German manufacturing. The strategy, dubbed Industry 4.0, seeks to move beyond the first Industrial Revolution (based on water and steam power), the second Industrial Revolution (electric power) and our current third Industrial Revolution which relies on electronics and digital information technology to increase productivity. Considering how advanced German manufacturing is already, particularly in the use of sophisticated robot manufacturing technology, what could a fourth Industrial Revolution bring to the table? Industry 4.0 advocates predict an industrial future based on Smart Factories that take advantage of the Internet of Things, the Internet of Services and Cyber Physical Systems which communicate not only with human workers, but with other systems. Okay, that’s very interesting, but what does that mean in practical terms? Let’s look at some examples. In the video below, you can watch the award-winning transport robot from incubed IT load and unload a conveyor belt. This simple action illustrates a couple of the Industry 4.0 design principles. First, the robot makes decisions on its own (decentralization principle) as it navigates independently from place to place and does so in real time (real-time utility principle). The transport robot from incubed IT, based in Graz, Austria, won over the jury for the Hannover Messe robotics award. Their robot can find its way around obstructions without any navigational floor markings or other hints. The next example (see video below) is the YuMi robot from industry giant ABB, which made a big splash at this week’s Hannover Messe . Its two arms with flexible hands and a friendly industrial design give it an anthropomorphic appearance. If you didn’t realize, the name YuMi is a play on words for you and me. And, as you might expect, this robot is designed to work directly with human workers, which is another industry 4.0 principle (interoperability). As we discussed last year in an article on robot companion workers, one of the underlying challenges for robots like YuMi is to make the robotics programming code and mechanical systems safe enough to operate in a cage-free environment interacting directly with human workers. The YuMI (short for You and Me) robot from ABB made a big impression at this week’s Hannover Messe. The YuMi robot is designed to work hand in hand with human factory workers. One of the things that makes innovation in robotics so fascinating is there is so much territory to cover and so many things to improve on. The German company Festo consistently delights us with their discoveries, often inspired by nature, and they did so once again this year with three outstanding innovative ideas. First up is their demonstration of a new FlexShapeGripper, which does not use the human hand for inspiration; instead, it uses a design inspired by the insect-nabbing tongue of a gecko to gently pick up a irregular shaped objects. The next two demonstrations from Festo are superb examples of Industry 4.0 design principles of decentralization, interoperability and real-time decision-making capability. Take a look at the video below of the Festo flying robot butterflies. They use an inside GPS system to independently navigate through the building atrium as well as communicate with one another to avoid collisions while flying in groups. Festo demonstrated flying robotic butterflies at Hannover Messe. They use an intelligent networking system to coordinate flight. We’ve saved the best for last. Festo unleashed their BionicANTS at Hannover Messe. Each ant is a form-follows-function work of art — with visible electronic wiring mounted directly on the surfaces — built using an advanced 3D MID / laser-sintered component manufacturing process. The ants move in a realistic manner; this is accomplished by built-in low power piezo electric bending actuators. A final design touch: the ants’ antennae serve as clever battery recharging contacts. But the coup de gras is the ants uncanny ability to perform cooperative tasks, like working together to move large objects relative to their size (just like real ants!) Each ant operates independently, yet works together with other ants to achieve group tasks. How is it possible? Each ant ‘brain’ has been programmed with an extensive set of rules, and they can communicate with each other directly. Festo’s BionicANTS at Hannover Messe demonstrate cooperative behavior. Each ant operates independently, yet works together with other ants to achieve group tasks. We invite you to join the roster of satisfied Formaspace technical, manufacturing and laboratory furniture clients — including Apple Computer, Boeing, Dell, Eli Lilly, Exxon Mobile, Ford, General Electric, Intel, Lockheed Martin, Medtronic, NASA, Novartis, Stanford University, Toyota and more. Give us a call today at 800.251.1505 to find out more about the Formaspace line of built-to-order computer workstations, industrial workbenches, laboratory furniture, lab benches and dry lab/wet labs — as well as our design / furniture consulting services. Like all Formaspace furniture, it’s backed by our famous 12 year, three shift guarantee.